Christmas Lollipops – Buy in Bulk and Save Christmas lollipops make the perfect stocking stuffer or holiday treat when it comes time to celebrate this special season. Metro Candy has a wonderful selection of Christmas lollipops, sold in bulk, so you can save on each of our unique holiday sweets. 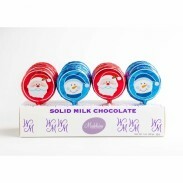 Choose swirly Christmas lollipops, milk chocolate lollies, even festively decorated marshmallow snowmen and Santa lollipops. Bring out the festivity and fun of the holiday with Christmas lollipops sure to make your taste buds pop. Add Pop to the Holidays with Christmas Lollipops Welcome your guests or customers with Christmas lollipops and you'll be remembered sweetly. Take the opportunity to buy our Christmas lollipops in bulk to make your holidays even more joyous with wholesale pricing that even the biggest scrooge would appreciate. You may also want to browse our candy canes, Christmas candy, and Christmas chocolate gift boxes for other sweet ways to celebrate this joyous holiday. 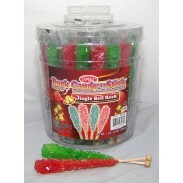 To start shopping for Christmas lollipops at wholesale prices, please click on the items below. If you have any questions about our bulk Christmas lollipops, visit our FAQ section or contact us for more information. Our friendly staff will be happy to answer all your questions. Rock Candy on a Stick 36ct. Christmas "Jingle Bell Rock"